The 39-year-old actress isn’t the only celebrity who swears by this particular approach to healthy eating: Tom and Gisele Brady, Gwyneth Paltrow, Jennifer Aniston, Jared Leto, Kirsten Dunst and Victoria Beckham are all fans of the pH Miracle Lifestyle and Diet. So how exactly does it work? The diet is based on the theory that different types of food leave behind different types of waste — metabolic, respiratory, dietary and environmental by-products can be either acidic, alkaline or neutral. Scientific medical studies have confirmed the pH Miracle theory behind this theory in the prevention and treatment of cancer, diabetes, heart disease, lupus, Cystic fibrosis, healthy weight loss, just to name a few (www.drrobertyoung.com), there’s certainly no harm in fostering healthy eating habits. And for Kate, there’s plenty of room for trial — and even more for error. “If I want to go out and eat at a restaurant with amazing food, I’ll do that,” she said — but she’ll try and “keep it light” beforehand. Kate’s normal day-to-day meals include lentil tacos, gluten-free pasta with veggies, steamed fish “in greaseproof paper,” almond milk-based butternut squash soup, and vegetable stir-fry over brown rice. To learn more about healthy alkalizing weight loss and/or weight gain read, The pH Miracle for Weight Loss and learn how the Worlds top athletes and celebrities achieve extraordinary energy, health, fitness and longevity. The pH Miracle Performance Center powered by Acquaforte is a centre of excellence for professional and amateur sports players, who want a personalized training strategy to achieve the best results in terms of muscle balance, personalized improvement in their individual sport, weight loss and general health, fitness and well-being. Under the guidance of an extraordinary and close-knit team of athletics trainers, sports doctors, massage therapists, osteopaths, chiropractors and nutritionists, the Performance Center provides the most accurate analysis of every pathological condition and then an effective course of treatment, even when time is short, such as on holiday. The training method of the Performance Center, aimed at improving skills, is based on the search for a new kind of balance, the result of resolving any postural issues and at the same time introducing new training methods that are personalized on the basis of the analyses provided by the Forte Lab medical team. Each type of training is designed to the needs of the guests and takes place in the state-of-the-art Fitness Room at Acquaforte Thalasso & Spa. Depending on the different cases in question, activity in the gym is combined with the thalassotherapy course, which, in a weightless environment, allows you to effortlessly perform a series of exercises that are totally effective for getting your body back in shape. To learn more or to register for your personalized pH Miracle Retreat email us at: phmiraclelife@gmail.com or give us at call at: 760 484 1075 or 760 751 8321. Libro Basico: La milagrosa dieta del pH donde viene el tratamiento general de Robert O Young. Segundo libro: La milagrosa dieta del pH para bajar de peso. Ambos disponibles en Librerias de prestigio como el sotano, La ventana, Amazon entre otras. 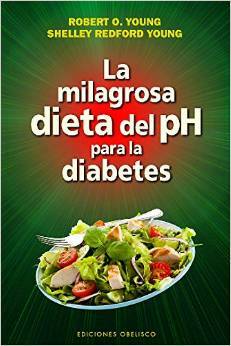 Y ya pueden pedir en Amazon el tercer libro de la serie: La milagrosa dieta del pH para la diabetes que se publicará en Junio del 2015. Esto no es solo para diabéticos e intolerantes a la glucosa, sino para cualquier persona con deseos de conocer su causa raiz y sobretodo como poder prevenir la destrucción de ese organo tan importante en nuestro organismo y aíi poder evitarla al cambiar tu regimen alimenticio antes de que sea demasiado tarde. Espero pronto se publique el libro para el cáncer en español.